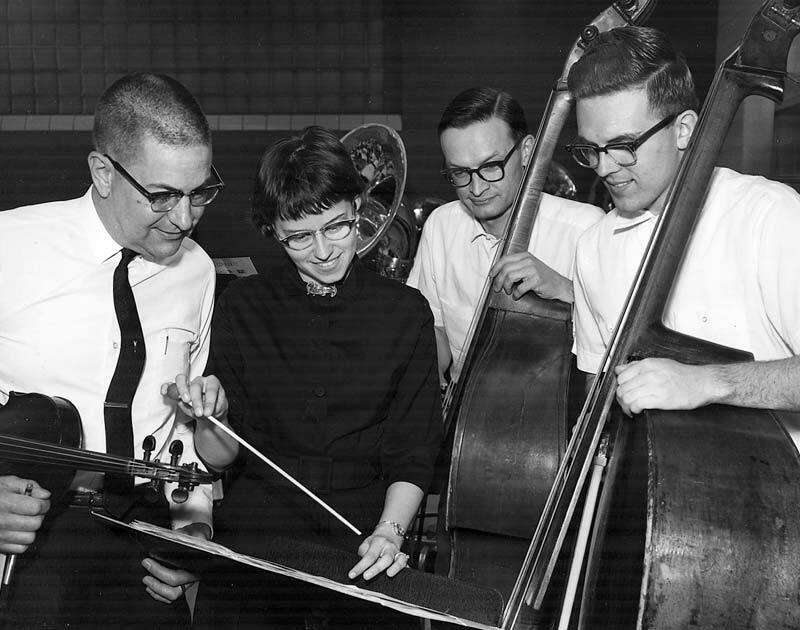 From left: Fred Mitchell, Linda Hershey, Hadley Richards, and Roger Perry review music in June 1963. A little over 50 years ago, a group of friends would gather to play music in the home of Fred and Virginia Mitchell, residents of North Olmsted. They mostly played for their own enjoyment, but would occasionally perform in church functions. Due to the large number of talented musicians in the area, the group outgrew the Mitchell’s house. With the help of the Mayor, the North Olmsted Recreation Commission and the N.O. 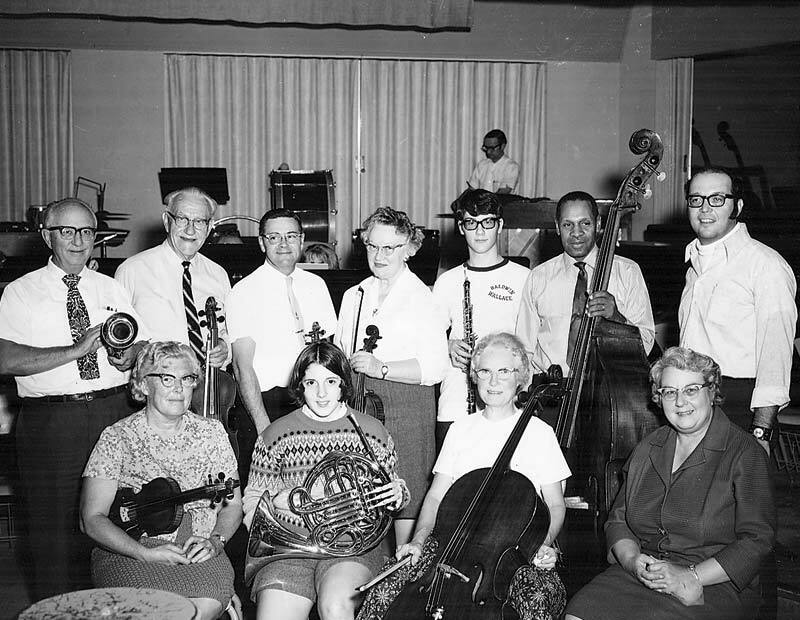 Board of Education, the Mitchells formed the North Olmsted Community Orchestra in 1963. Soon after, rehearsals were being conducted once a week in the N.O. High School Band room (now the Middle School) by Mrs. Linda Hershey, Director of the N.O. High School Orchestra. The 45 member orchestra held their first concert on June 9, 1963 in the Auditorium. Over the years musicians from surrounding communities (and counties) have joined the orchestra. 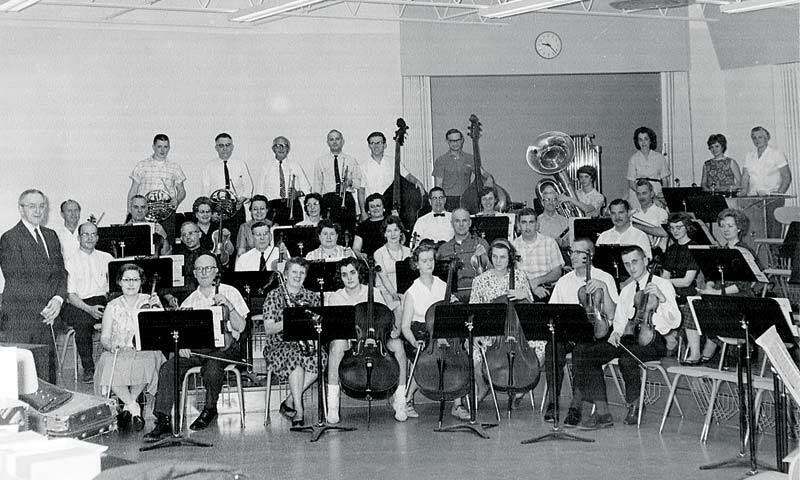 In 1976 the North Olmsted Community Orchestra changed its name to Symphony West Orchestra to better reflect its membership. 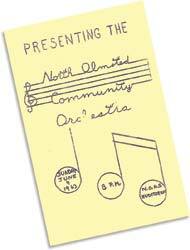 June 9, 1963: North Olmsted Community Orchestra performs its first concert. February 6, 1966: A Flute Quartet featuring Richard Kadar, Delores Lowe, Ruth Rayle, and Evelyn Scibbe performed The Penny Whistle Song by Leroy Anderson. March 31, 1968: Edmund Siennicki conducted his new piece Dorian Sketch, which he composed for the Orchestra. 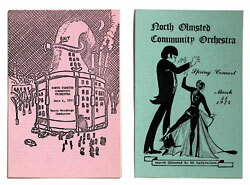 Performances in the early 1970s coincided with exhibits by the North Olmsted Art League. A “Request Form” for audience members to specify what they wanted to hear performed frequently appeared in the program. The 20th Anniversary Concert on December 10, 1982 featured a large adult chorus. April 29, 1983: The Orchestra performed the Battle Hymn of the Republic with the John Knox choir. Audience participation was encouraged! The 25th Anniversary Concert in May, 1988 featured Jocelyn Chang’s ensemble of 10 harps. They performed arrangements of “Singin’ in the Rain” and the theme from Hill Street Blues. The May 5, 1995 and December 8, 1995 concerts featured the Martindale Puppeteers. In May they performed Peter and the Wolf, and in December The Nutcracker Suite. November 1, 2002 “Music of the Night”: Conductor Jim Meyers successfully cut to an entirely different arrangement of selections from Phantom of the Opera, and then back to the original arrangement! Above: Anne Triplett rehearses her moves as the Pink Panther with conductor Victoria Marra. Right: John Lucero, a.k.a. Inspector Clouseau. March 13, 2004: Symphony West’s own René Niemoller (Violin), June Romeo (Violin), Michelle Neudeck (Viola) and Julie Hickin (Cello) performed the “Fandango” from Boccherini’s First Quintet in D Major with guest artist Winslow Browning (Guitar). May 12, 2007 “A Little Light Music” with special guest... the Pink Panther! As the Orchestra performed Mancini’s theme from The Pink Panther, Anne Triplett (Flute) donned a rented costume, while John Lucero (French Horn) played the bumbling Inspector Clouseau. 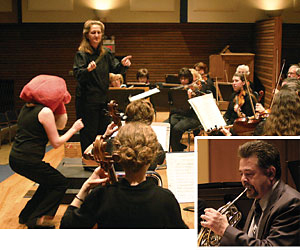 May 15, 2009 “Friday Funnies” featured Symphony West’s own Betty Herten and Bob Kuebler performing P.D.Q. Bach’s Panther Dance for two bassoons. May 14, 2010 “Danube Destinations” featured Symphony West violinist Denise Lavin and oboist Bruce Biggin’s triumphant performance of J.S. Bach’s Concerto for Violin and Oboe in C minor, BMV 1060. The concert also featured vocalist Nadia Tarnawsky and cimbalom player Alexander Fedoriouk. May 17, 2013 marked Symphony West's gala 50th Anniversary Celebration concert! The performance featured the world premier of Celebration Overture by Cleveland area composer William F. Rayer. 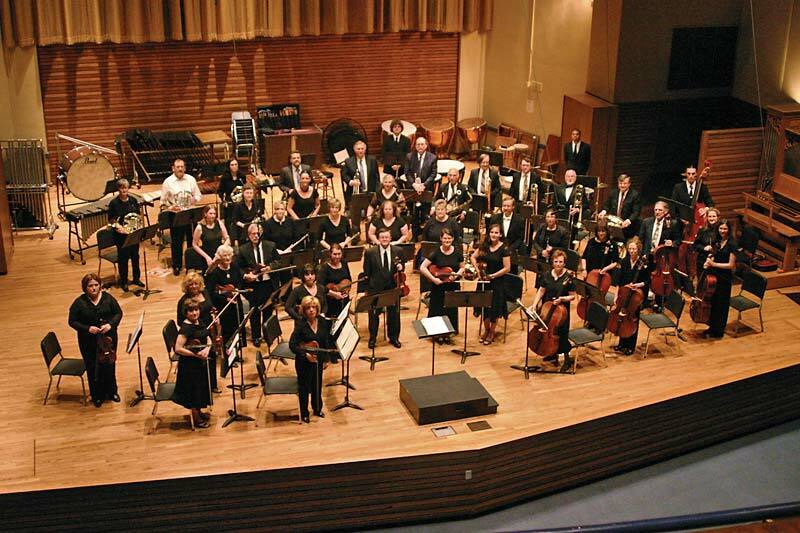 2015 was Symphony West's "Year of American Music." 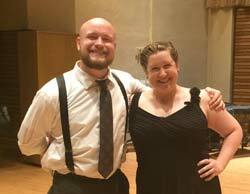 March 13, 2015 "America: North, South, and West" included Civil War reenactors from The 29th Ohio Volunteer Infantry Living History Association, and June 5, 2015 "American Showtime" featured swing dance duo Jessie and Rich Rowe. 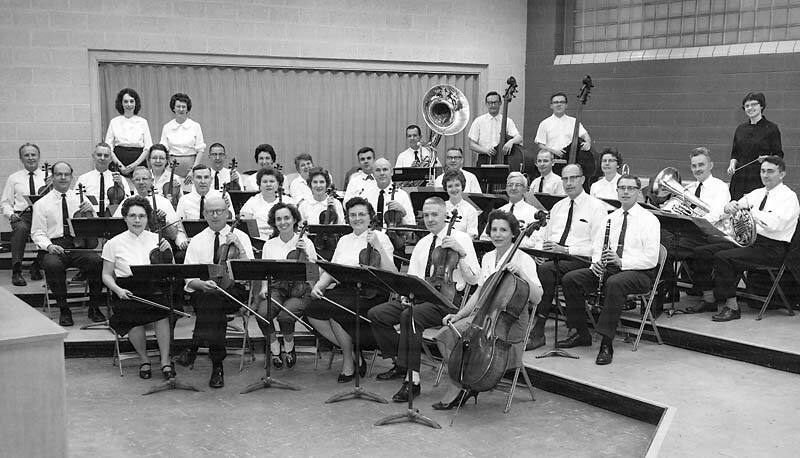 The Orchestra in the mid-1960s, under the direction of John Stavash. Conductor Terry Woodings with orchestra members in 1972. 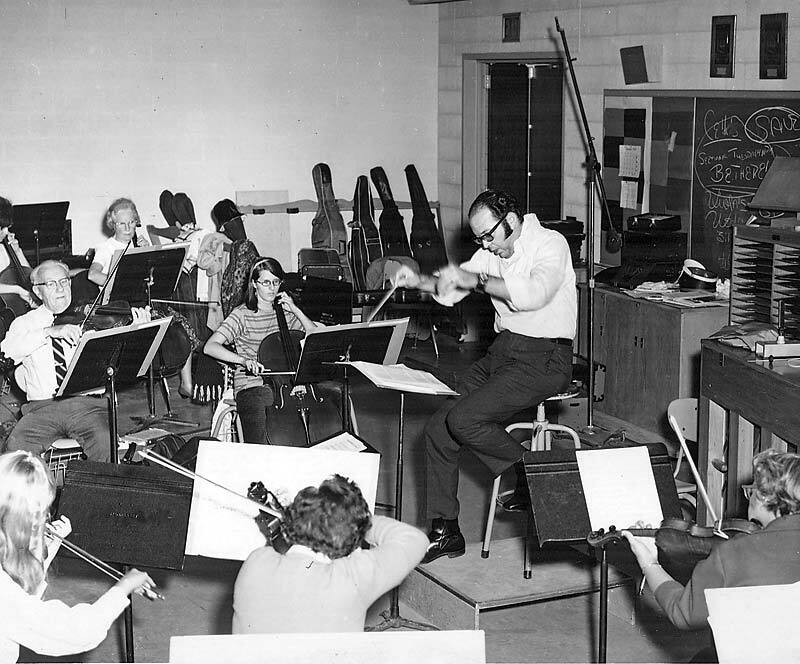 Terry Woodings rehearses the Orchestra in the early 1970s. 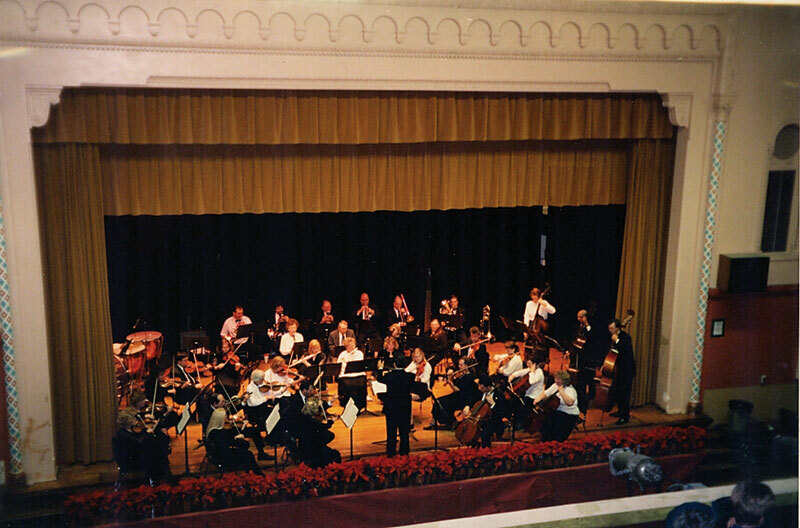 John Kepperley conducts a Christmas Concert in the 1990s at the North Olmsted Middle School Auditorium. 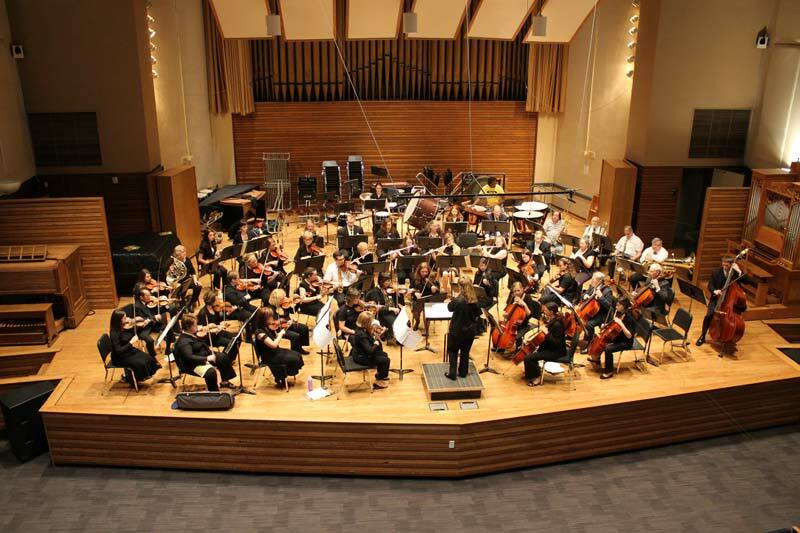 Symphony West Orchestra in May, 2007. Symphony West's dress rehearsal for its 50th anniversary concert May 17, 2013 in Gamble Auditorium at Baldwin Wallace University.